That is just so me, in dress, at least. The little girl in me who hates itchy seams, lace, and having her hair curled on Sunday mornings loves this sweater. 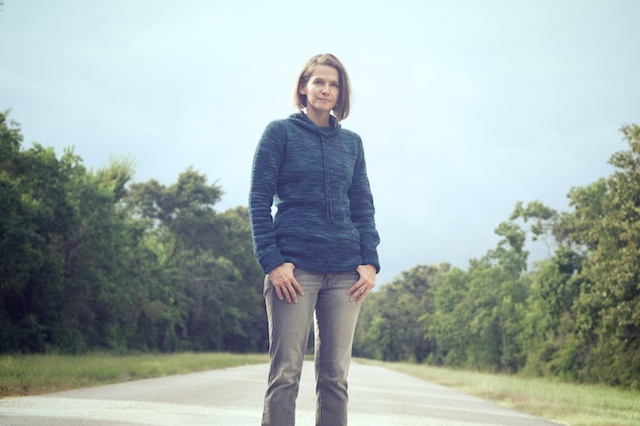 It feels like an old, comfy sweatshirt, but it's so much nicer than that. 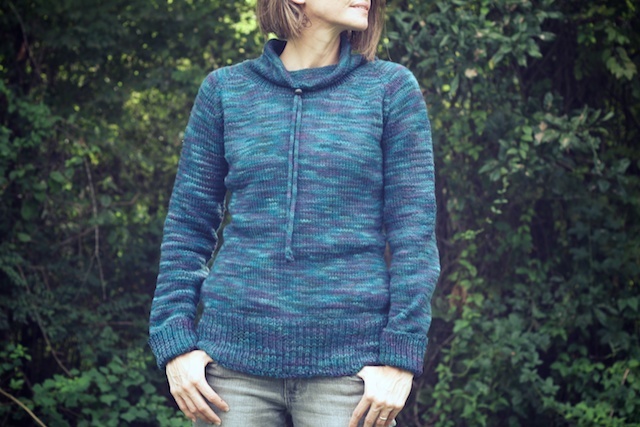 There's a reason this pattern, by Alicia Plummer, is so popular. Ease is my first pattern by Alicia, whose Nested, Palmer, and Backshore are all in my Ravelry favorites. For such a simple, comfortable design, there really were a lot of interesting details and shaping. I'm glad I trusted the pattern because the shape turned out exactly as it should. I don't know why anyone would modify this to be fitted. It is the perfect comfy sweater. Ease was also my intro into the world of continental knitting. By the time I joined it in the round, at the neck, I was already confident in my continental knit stitch. So doing that in the round was a snap. It also allowed me to get a tighter gauge with larger needles, though they were bamboo needles (for a little grab on the wool). Details: I used size 5 bamboo circulars on the body, 3s on the collar, and size 1s on the ribbing. This really is an improvement in needle sizes. It gave me 16 stitches per 4". I knit the 32-34 size, which allows for 3-4 inches of positive ease. 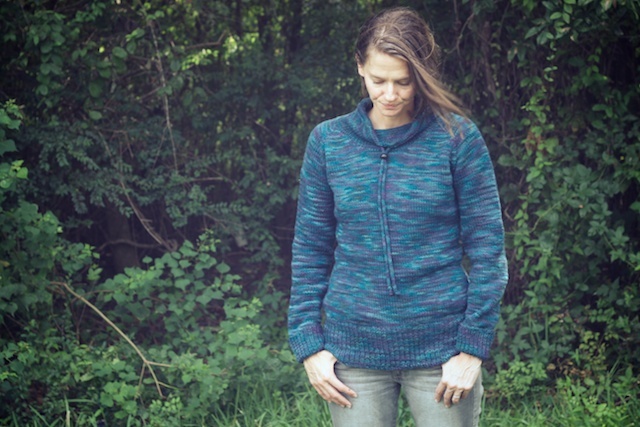 I loved the blue yarn used for the pattern sample, but I just don't have the yarn budget for a big sweater's worth of Rios. I did see Cascade 220 Paints (in Emerald City) on sale for less than $6 a skein at Webs, so I scooped it up months ago, anticipating the next Summer Sweater KAL. A lot of the 220 Paints color ways are too variegated for me, but this one seemed subtle enough. Either I'm getting very used to wool next to my skin or this yarn is incredible soft for 100% wool. I think it's just soft. My mods: I did knit this about an inch longer than directed for my torso length and made sure my sleeves were long enough to cuff. I also used Jeny's Surprisingly Stretchy Bind Off for the hem ribbing, but I'm not sure if it's tight enough. I used Elizabeth Zimmerman's sewn bind off for the cuffs, and they're perfect. In picking up stitches for the collar, I had to skip more stitches than directed to get a similar stitch count. I picked up every back, shoulder, and low front stitch, but only picked up one of three on the angled front neckline. I got 92 stitches total and went with it. I decided to use a 3 stitch I-cord for the drawstring, but it was thicker than I wanted. I tried blocking it out around the backs of our dining chairs, but it didn't thin it out as much as I'd like. I can always knit a 2 stitch I-cord to replace it. As far as inserting the drawstring goes, I just whipstitched my collar fold around the drawstring, no special needles for me. I also ran a cord stopper up the drawstring to try it out. Not sure if I'll keep it. 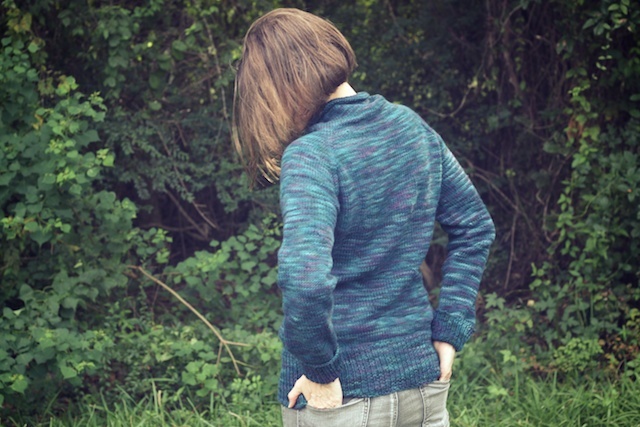 So, my first sweater for the Summer Sweater KAL of 2014 is finished! The rest is gravy. However, the gravy is almost there. I'm past the armholes on Featherweight, but not far at all on Aidez. I also got out of my backyard for these photos and bribed my son to take them. It was either help get groceries or this. Amazingly, he chose photography. He also cut my head out of most of them. Other posts on Ease: prepping, all in continental, two sleeves at once, and the collar. That sweater came out beautiful, and that color looks amazing on you. 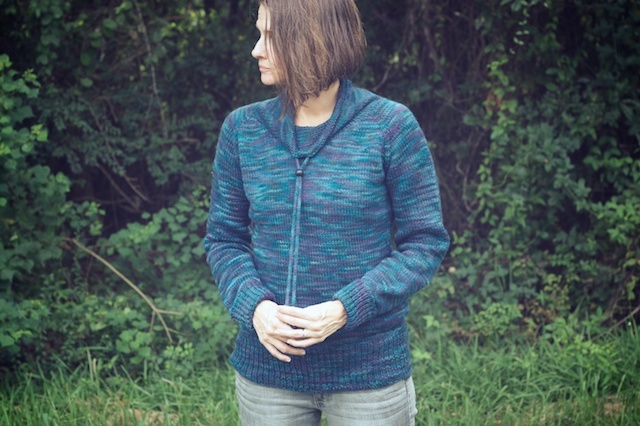 I'm always nervous about using variegated yarns on sweaters, but yours looks fabulous. Gorgeous!! 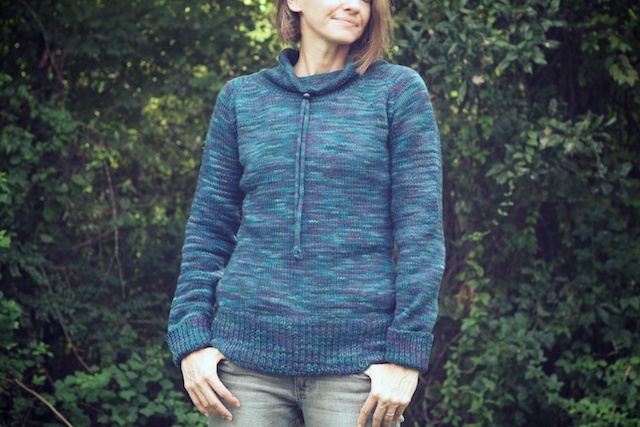 I love it-- and the variegated yarn is wonderful. Thank you, Cherry! 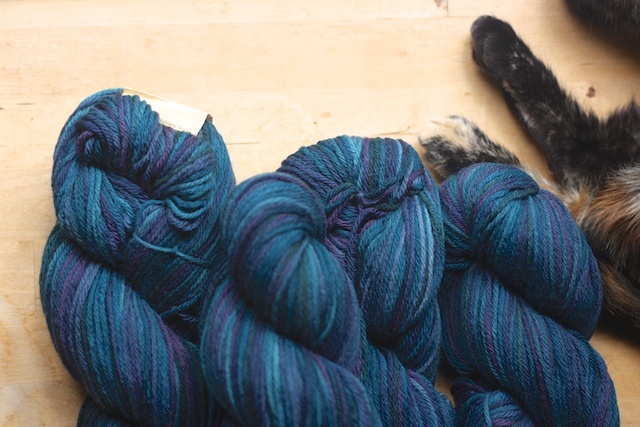 Variegated yarns make me nervous too, but this colorway was pretty sedate. I like the variegation because it makes me think of the seventies, thought the color doesn't. Thanks, Libby! You're oone to talk! 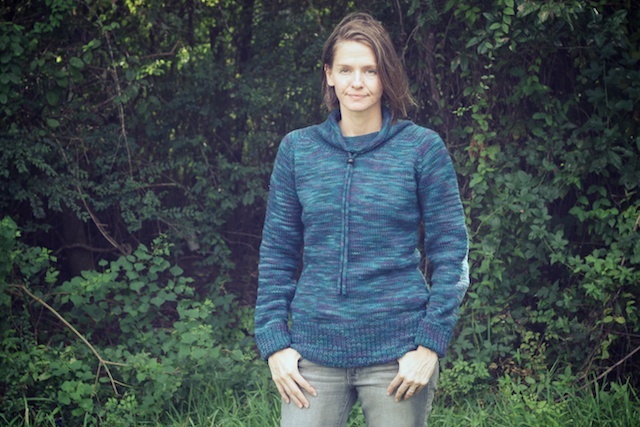 Your knits and photos are so lovely, especially your new shawl photos! Ease really does seem like required weekend wear for all knitters, though. Oh thanks, Vanessa. I'll tell him you said he should take FO photos for me all the time. He'll be so thrilled :) He did fine, it was just a difficult time of day and a weird location. We literally stopped on the road by our house so I could have some greenery. It is super comfy, too! Thank you so much! 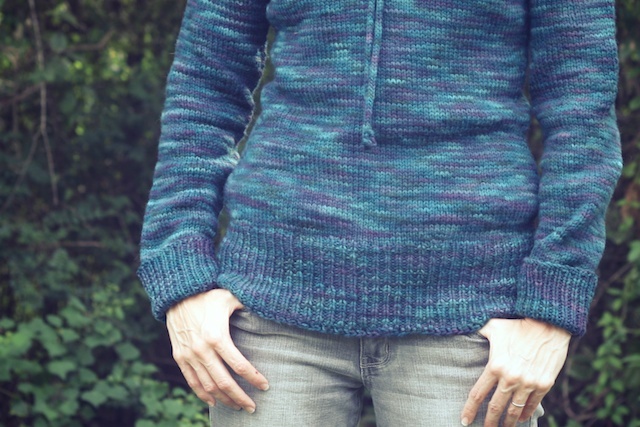 This is my first variegated sweater like this. I did one years ago, but it just didn't come out too good. I still plan to dye it black one of these days.